"Les Abstraites" There are 32 jewelry. Give shine and brightness to your style with these red teardrop earrings: Curved glass cabochons. French hook ear wires. Each copy may be slightly different from the photo. Freeshipping! 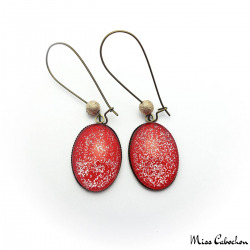 Give shine and brightness to your style with these red dangle earrings with silver glitter: Curved glass cabochon. Kidney ear wires. The beads are not fixed and can be removed as you wish. Each copy may be slightly different from the photo. Freeshipping all around the world! 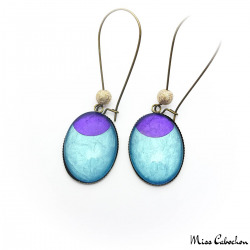 Teardrop earrings - Purple Moon on Blue: Curved glass cabochons. French hook ear wires. Each copy may be slightly different from the photo. Freeshipping! 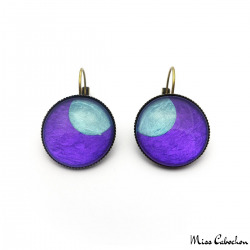 Dangle earrings - Purple Moon on Blue: Curved glass cabochon. Kidney ear wires. The beads are not fixed and can be removed as you wish. Each copy may be slightly different from the photo. Freeshipping all around the world! 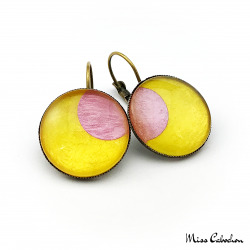 Teardrop earrings - Pink Moon on Yellow: Curved glass cabochons. French hook ear wires. Each copy may be slightly different from the photo. Freeshipping! Dangle earrings - Pink Moon on Yellow: Curved glass cabochon. Kidney ear wires. The beads are not fixed and can be removed as you wish. Each copy may be slightly different from the photo. Freeshipping all around the world! 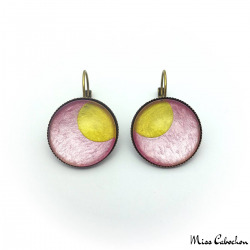 Round earrings - Pink Moon on Yellow: Curved glass cabochons. Omega backs (Frenck backs). Each copy is handmade and may be slightly different from the picture. Freeshipping all over the world! Two-tone teardrop earrings with golden border: Curved glass cabochons. French hook ear wires. Each copy may be slightly different from the photo. Freeshipping! 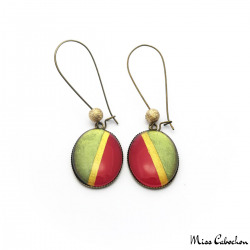 Two-tone dangle earrings with golden border: Curved glass cabochon. Kidney ear wires. The beads are not fixed and can be removed as you wish. Each copy may be slightly different from the photo. Freeshipping all around the world! 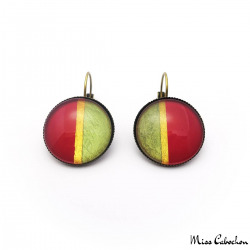 Two-tone earrings with golden border: Curved glass cabochons. Omega backs (Frenck backs). Each copy is handmade and may be slightly different from the picture. Freeshipping all over the world! 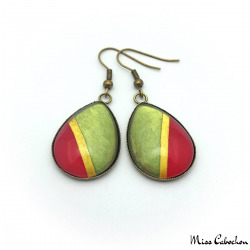 Trendy teardrop earrings - Green and Orange: Curved glass cabochons. French hook ear wires. Each copy may be slightly different from the photo. Freeshipping! 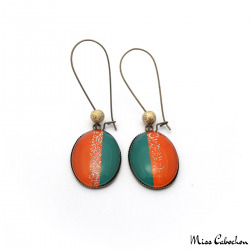 Trendy dangle earrings - Green and Orange: Curved glass cabochon. Kidney ear wires. The beads are not fixed and can be removed as you wish. Each copy may be slightly different from the photo. Freeshipping all around the world! 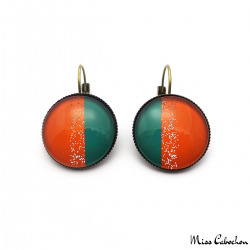 Trendy round earrings - Green and Orange: Curved glass cabochons. Omega backs (Frenck backs). Each copy is handmade and may be slightly different from the picture. Freeshipping all over the world! 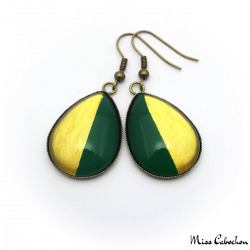 Two-tone teardrop earrings - Green and Golden: Curved glass cabochons. French hook ear wires. Each copy may be slightly different from the photo. Freeshipping! 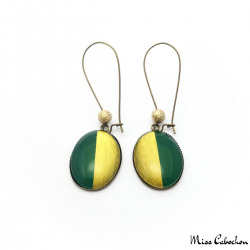 Two-tone Dangle earrings - Green and Golden: Curved glass cabochon. Kidney ear wires. The beads are not fixed and can be removed as you wish. Each copy may be slightly different from the photo. Freeshipping all around the world! 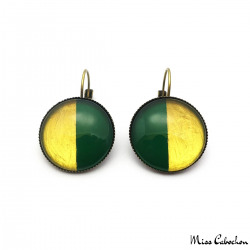 Two-tone round earrings - Green and Golden: Curved glass cabochons. Omega backs (Frenck backs). Each copy is handmade and may be slightly different from the picture. Freeshipping all over the world! 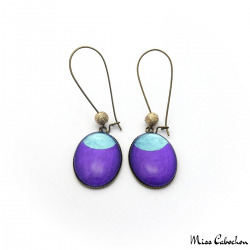 Teardrop earrings - Blue Moon on Purple: Curved glass cabochons. French hook ear wires. Each copy may be slightly different from the photo. Freeshipping! Dangle earrings - Blue Moon on Purple: Curved glass cabochon. Kidney ear wires. The beads are not fixed and can be removed as you wish. Each copy may be slightly different from the photo. Freeshipping all around the world! Round earrings - Blue Moon on Purple: Curved glass cabochons. Omega backs (Frenck backs). Each copy is handmade and may be slightly different from the picture. Freeshipping all over the world! Round earrings - Golden Moon on Pink: Curved glass cabochons. Omega backs (Frenck backs). Each copy is handmade and may be slightly different from the picture. Freeshipping all over the world! 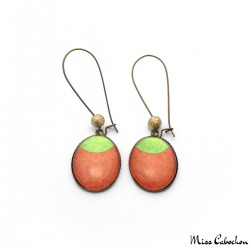 Teardrop earrings - Green Moon on Orange: Curved glass cabochons. French hook ear wires. Each copy may be slightly different from the photo. Freeshipping! Dangle earrings - Green Moon on Orange: Curved glass cabochon. Kidney ear wires. The beads are not fixed and can be removed as you wish. Each copy may be slightly different from the photo. Freeshipping all around the world! 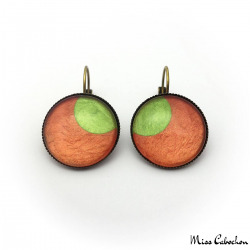 Round earrings - Green Moon on Orange: Curved glass cabochons. Omega backs (Frenck backs). Each copy is handmade and may be slightly different from the picture. Freeshipping all over the world! Teardrop earrings - Pink Moon on Green: Curved glass cabochons. French hook ear wires. Each copy may be slightly different from the photo. Freeshipping!